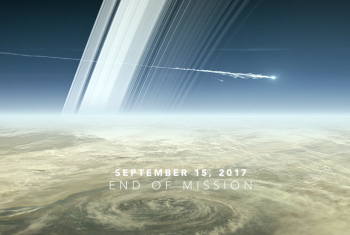 Exactly 38 years to the day after Pioneer 11 became the first spacecraft to encounter the planet Saturn, NASA’s flagship mission to the ringed planet, Cassini, is entering the final two weeks of its storied mission. Cassini’s final timeline will begin on 12 September with “the kiss goodbye” – a gravitational nudge from Titan – that will irrevocably alter Cassini’s trajectory, sending the probe on a course for a destructive breakup into Saturn’s atmosphere. Like its predecessor Pioneer 10, the Pioneer 11 probe was designed by NASA to serve as a pathfinder mission to the asteroid belt and Jupiter; except unlike its sister, Pioneer 11 would continue past Jupiter to become the first probe to encounter Saturn. Overall, Pioneer 11’s mission was to investigate environments of the asteroid belt, Jupiter, and Saturn ahead of the flagship Voyager missions to follow. 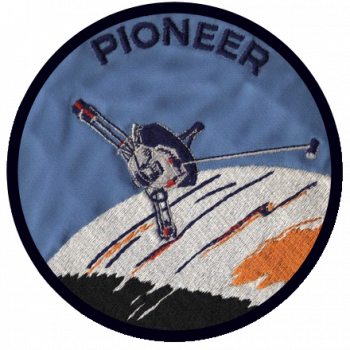 As with its twin probe, Pioneer 11 was formally approved by NASA in February 1969 as part of a dual probe initiative to study the outer solar system, with specific mission objectives of exploring the interplanetary medium beyond Mars, investigating the nature of the asteroid belt from a scientific standpoint and assessing the belt’s possible hazards for missions to the outer planets, and exploring the environment around Jupiter. But this is where Pioneer 11’s similarities to Pioneer 10 end. In addition to those objectives, Pioneer 11 took on the added responsibilities of mapping the magnetic field of Saturn and characterizing its intensity, direction, and structure; determining the number of electrons and protons of various energies distributed along its trajectory through the Saturnian system; mapping the interaction of Saturn with the solar wind; and measuring the temperature of Saturn’s and Titan’s atmospheres. 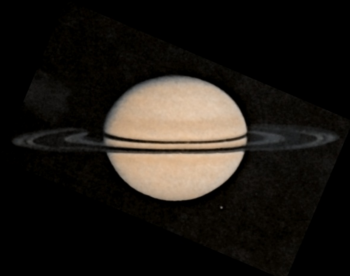 Moreover, Pioneer 11 was tasked with determining the structure of Saturn’s upper atmosphere; mapping the planet’s thermal structures via infrared observations and radio occultations; obtaining spin scan images in two colors of the Saturnian system; probing Saturn’s ring system during S-band radio occultations; determining a precise measurement for the mass of Saturn and its larger moons; and verifying the environment of the ring plane to validate safety measures and planned trajectories for the soon-to-follow Voyager 1 and Voyager 2 probes. In terms of power generation, design, and scientific instrumentation, Pioneer 11 was identical to Pioneer 10 – though its launch would come more than a year after its twin. 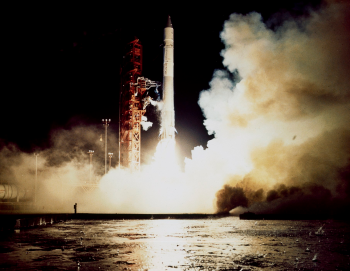 Pioneer 11 launched from the Cape Canaveral Air Force Station and LC-36A atop an Atlas-Centaur rocket on 6 April 1973 at 02:11:00 GMT. The craft embarked on its passage through the asteroid belt slightly more than one year later on 19 April 1974. Observations of Jupiter began on 3 November 1974, with the Jovian encounter commencing on 2 December. During its encounter with Jupiter, Pioneer 11 flew within several hundred thousand kilometers of Callisto, Ganymede, Io, and Europa before entering Jupiter’s shadow on 3 December 1974, performing occultation observations of the giant planet beginning at 05:01:01 GMT that day. Closest approach with Jupiter occurred 20 minutes after occultation observations began, with Pioneer 11 passing just 42,828 km from the top of Jupiter’s clouds. Following closest approach, the craft flew by the moon Amalthea at a distance of 127,500 km. 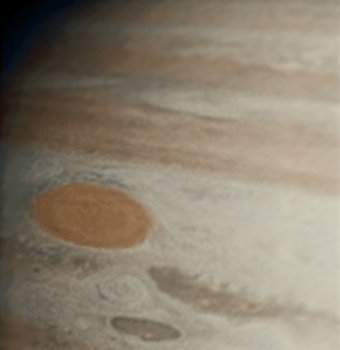 During its encounter with Jupiter, Pioneer 11 returned detailed photos and observations of the Great Red Spot, determined the mass of Callisto, and took the first photographs of Jupiter’s polar regions. After closest approach to Jupiter, Pioneer 11 was outbound from the Jovian system, having used the planet’s gravity for an assist maneuver to properly align itself for the cruise to and encounter with Saturn – becoming the first of what is now six probes to use Jupiter for a gravity assist and/or trajectory adjustment to send them onward to other destinations. Of the six probes to use Jupiter for gravity assists, four (Pioneer 11, Voyager 1, Voyager 2, and Cassini) have used the maneuver to go onward to the other major planets of the outer solar system, one (New Horizons) has used it for an encounter with Kuiper Belt dwarf planet Pluto, and one (Ulysses) has used the maneuver to fling itself out of the ecliptic plane of the solar system and into a polar orbit of the sun. Outbound from Jupiter, Pioneer 11 spent the next four and a half years in cruise mode before beginning observations of Saturn on 31 July 1979, more than one month ahead of its closest approach to the ringed planet. A month later, on 29 August 1979, Pioneer 11 flew by Iapetus and Phoebe at distances of 1,032,535 km and 13,713,574 km, respectively. 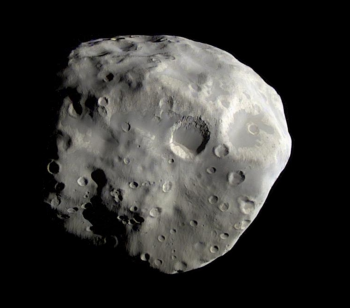 Two days later, the probe passed much closer to another Saturnian moon, Hyperion – encountering this satellite at a distance of 666,153 km. On 1 September, 38 years ago today, a rapid series of observations and events transpired for Pioneer 11. At 14:26:56 GMT, Pioneer 11 performed the first of two ring plane crossings, a descending plane crossing, before encountering the moons Epimetheus, Atlas, Dione, and Mimas over the next two hours as the probe dove towards Saturn. At 16:29:34 GMT on 1 September 1979, Pioneer 11 passed within 20,591 km of Saturn – becoming the first of – to date – only four probes to directly encounter the planet. Over the course of the next several hours, the probe performed occultation studies of Saturn, flew by the moons Janus, Tethys, Enceladus, Calypso, and Rhea, and performed a second ring plane crossing, this time an ascending crossing. The following day, Pioneer 11 made its closest approach to Titan at a distance of 362,962 km. Direct observations of the Saturnian system continued for more than a month following close encounter, with observations of Saturn ceasing on 5 October 1979 – at which point the craft began its interstellar mission. 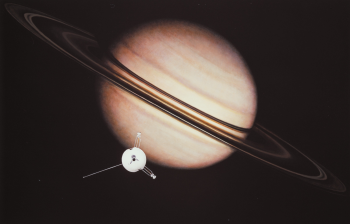 An important element to Pioneer 11’s encounter with Saturn was a determination of the ring plane environment around the planet, as both Voyager 1 and Voyager 2 were deemed too essential to get damaged and/or destroyed by Saturn’s rings. 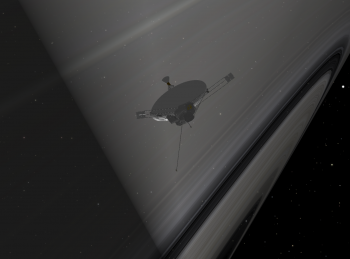 To this end, Pioneer 11 was sent on the same trajectory the Voyager probes planned to used; here, Pioneer 11 tested the route for faint ring particles that could damage the Voyagers. If Pioneer 11 had detected a dangerous environment in the ring system, Voyager 1’s and Voyager 2’s trajectories would have been altered to steer them clear of the rings, a maneuver that would have precluded any possibility of sending either of the probes on word to Uranus and Neptune. Among the many discoveries Pioneer 11 returned, was confirmation of a suspected but not confirmed moon, subsequently named Epimetheus. The moon was confirmed through imagery returned by Pioneer 11 just one day before the probe flew by the moon at a distance of 4,000 km (2,500 mi) – what amounts to a near collision. However, subsequent observations of the Saturnian system by Voyager 1 and Voyager 2 cast doubt on whether Epimetheus was indeed the moon involved in the near miss with Pioneer 11, as those spacecraft revealed that Epimetheus and Janus, a similarly sized moon, are co-orbital. Moreover, Pioneer 11 returned a discovery of another small moon and an additional ring around Saturn, charted the planet’s magnetosphere and magnetic field, and returned the first observations of Titan – indicating that the moon was too cold to harbor life. Following its encounter with Saturn, Pioneer 11 continued on its interstellar mission, examining the solar wind in the interplanetary medium between the outer planets. Unlike its twin, which lasted into the 21st century, Pioneer 11 was not as fortunate, with its mission coming to an end on 30 September 1995. Assuming the probe is still intact and has not destructively encountered another object, Pioneer 11 is currently 95.816 AU from the Sun traveling outward from the solar system at 2.4 AU per year. Having been overtaken by Voyager 1 and Voyager 2, and having always been behind Pioneer 10, Pioneer 11 – if intact – is the fourth farthest human-made object from Earth. As with its twin, Pioneer 11 carries a gold-anodized aluminum plaque. 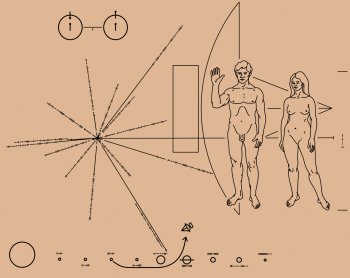 The plaque was the original idea of Eric Burgess and included on the Pioneer 10 and 11 probes at the request to NASA of Carl Sagan to provide information about the origin of the spacecraft in the event that either probe was ever found by intelligent life from another planetary system. Since Pioneer 11’s first explorations of Saturn in 1979, the Voyager probes executed flybys of the planet in November 1980 and August 1981. From then, it would take 22 years 10 months 4 days for the next probe to arrive. And nothing can compare to what Cassini-Huygens has taught us. 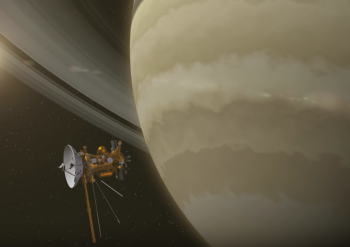 “The mission has exceeded all expectations,” said Curt Niebur, Cassini program scientist at NASA Headquarters during a media teleconference Tuesday. “We’ve been shocked by things we never expected. We’ve seen one of the truly weirdest features of the solar system – a hexagonal structure the size of Earth that’s been at Saturn’s north pole for decades. We’ve learned that Enceladus has all of the ingredients needed to support life right now. “Cassini has opened our eyes as to what the possibilities of life outside Earth might actually be, and the Grand Finale is using the last dregs of fuel to answer new questions and new science. Now, 13 years 2 months and 1 day after it first entered orbit of Saturn on 30 June 2004, the final fortnight of Cassini’s mission is at hand. 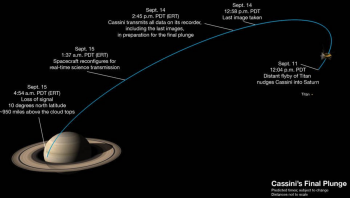 Currently, Cassini is undertaking its 291st orbit of Saturn – an orbit that will bring the craft to its penultimate dive into the upper traces of Saturn’s atmosphere at 09:17 EDT (13:17 GMT) on 2 September. Thus far, Orbit 291 has seen Cassini’s imaging cameras observe haze in Titan’s atmosphere while the Ultraviolet Imaging Spectrograph (UVIS) and Visible and Infrared Mapping Spectrometer (VIMS) instruments have observed Saturn’s sunlit north polar auroral region. Moreover, VIMS and the Composite Infrared Spectrometer (CIRS) have performed more detailed analyses of Saturn’s atmosphere. As Orbit 291 brings Cassini into Saturn’s upper atmosphere, the craft’s Ion and Neutral Mass Spectrometer (INMS) will perform its third session directly sampling Saturn’s upper atmosphere to measure the densities of different species of molecular hydrogen, helium, and a variety of ions in the immediate vicinity of the spacecraft. Data from this fourth dip into Saturn’s atmosphere will be transmitted back to Earth with an expected time of reception through the Deep Space Network of 01:59 EDT on 3 September. 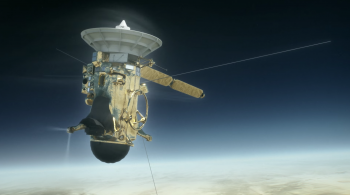 Orbit 291 will culminate on 5 September at 14:47 EDT (18:47 GMT) when Cassini reaches aposaturnium – the farthest point in its orbit from the planet. At this point, Cassini’s 292nd and final full orbit of Saturn will commence, during which Cassini’s CIRS and VIMS instruments will gather data to determine the abundance of helium in Saturn’s atmosphere. This orbit will then bring the spacecraft into its final dip into the planet’s atmosphere – an event that will occur on 8 September at 20:18 EDT (00:18 GMT on 9 September). 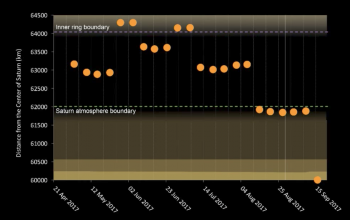 During the atmospheric dive, INMS will perform its fourth session directly sampling Saturn’s upper atmosphere to measure the densities of different species of molecular hydrogen, helium and a variety of ions in the immediate vicinity of the spacecraft. Moreover, Cassini’s RADAR will study ammonia in Saturn’s atmosphere and the Imaging Science Subsystem (ISS) will capture what is hoped will become an iconic image of the planet’s majestic rings seen looking outward from Saturn. Data gathered during the fifth and final dip into Saturn’s atmosphere is expected to be received through the Deep Space Network at 10:29 EDT on 9 September. Cassini will then continue away from Saturn on Orbit 292, until 12 September at 01:37 EDT (05:37 GMT). At this point, as Cassini reaches its final aposaturnium, Titan will pass just close enough to nudge the probe’s orbit. Dubbed “the kiss goodbye”, the final gravitational nudge from Titan will alter the probe’s orbit just enough to send the veteran spacecraft into a destructive dive into Saturn’s atmosphere that will bring an end to the storied 19 year 11 month mission of Cassini on 15 September.